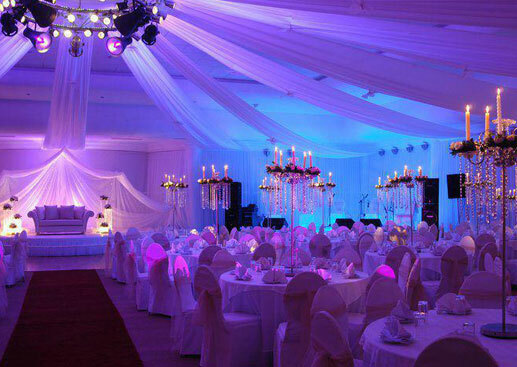 Moroccan tent rental services: Our wide range of furniture, lanterns, fabrics, and decorations are authentic. Let us be your getaway and guide into a fascinating and hidden world of authenticity; a world of tasty food, entertainment, and authentic craftsmanship with a modern Moroccan touch. 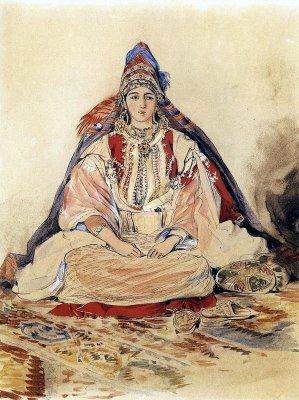 Moroccan Caidale tents traditionally belonged to the palace and were erected to welcome Kings and Sultans as they traveled the Kingdom and entertained their guests. 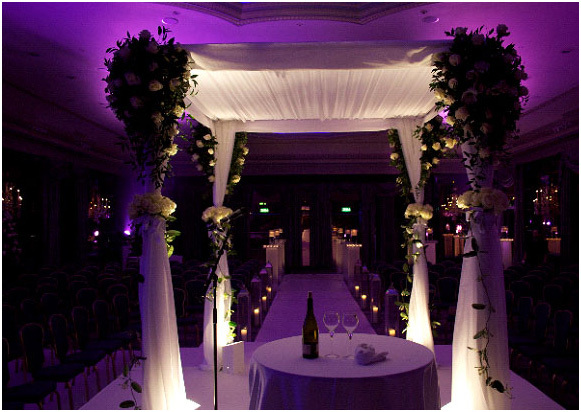 Today, although still used by the palace, these Caidale tents have gained notoriety among event and theme party planners. 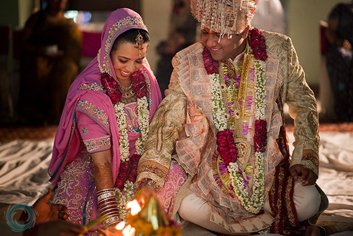 They make an excellent alternative to the usual white tents and are used for wedding ceremonies, national festivities, as well as religious celebrations and parties. 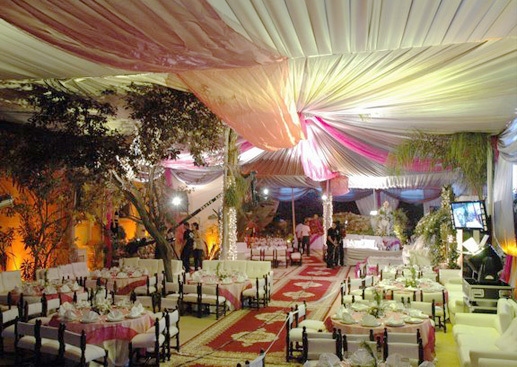 Moroccan Caidale tents can be custom made in many different sizes. 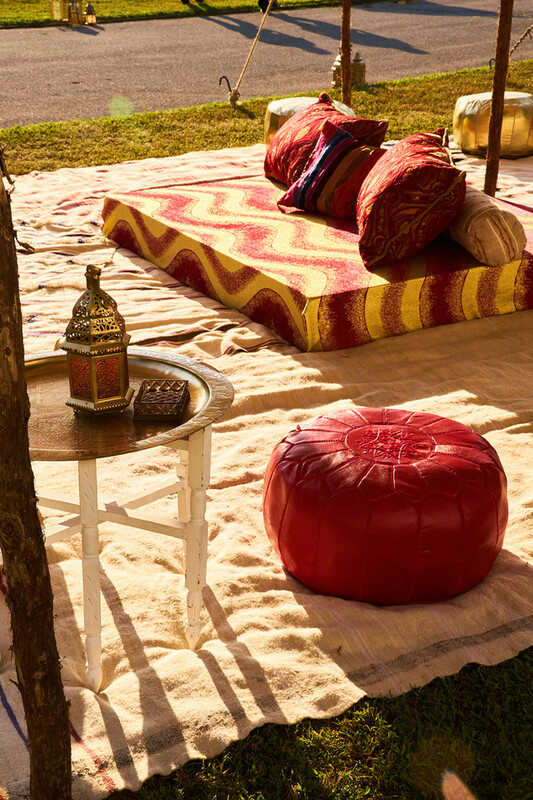 These handmade Moroccan tents and their designs make them unique and exclusive. We create new styles and designs, from traditional hand block and screen printing to hand-woven silks and modern textiles with small intricate designs in geometric pattern, but still feeling the exquisite Arabian Moorish mood. 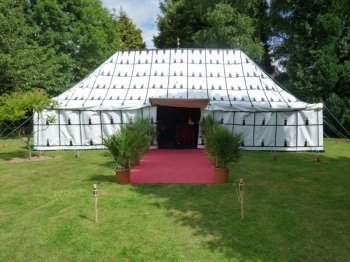 The exterior of the Moroccan tents are made of leather, not the usual canvas to ensure long life and heavy usage. 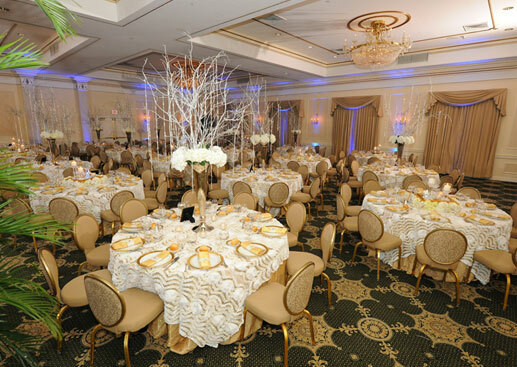 Go beyond a white tent on the lawn for your celebration with our Caidal tent rental. Known to be traditionally used to welcome Kings and Sultans as they traveled the Kingdom and entertained their guests, these structures are still used by the palace today. 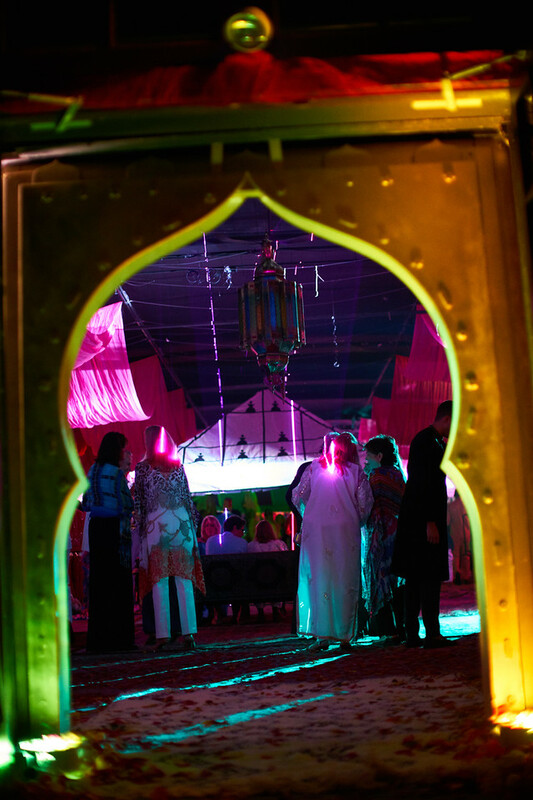 Take advantage of our Moroccan tent rental options for wedding ceremonies, national festivities, religious celebrations and parties to portray exquisite an Arabian Moorish mood. 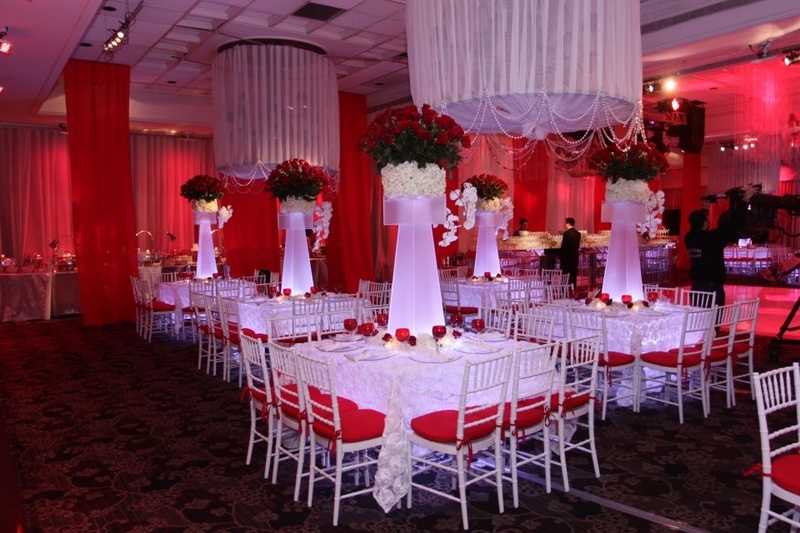 Caidal tent rental is customizable and available in various sizes and because they are handmade, these pavilions are unique and exclusive. With new styles and designs continuing to emerge, hosts can choose from traditional hand block and screen printing to hand-woven silks and modern textiles with small intricate designs in geometric pattern. Made of leather instead of canvas, these items hold up well even when used heavily. 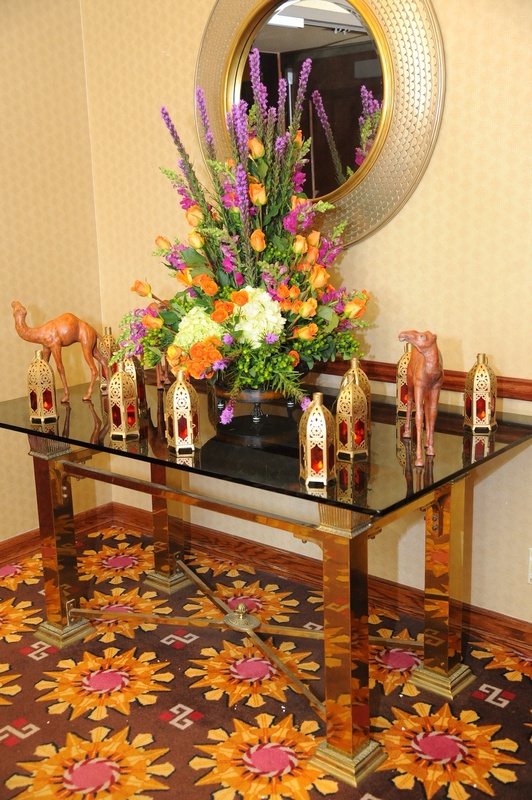 Along with Caidal tent rental, utilize our company’s Henna décor rental to truly make your event complete and one your guests will talk about for years. 3 Poles in the middle – for outside use only. 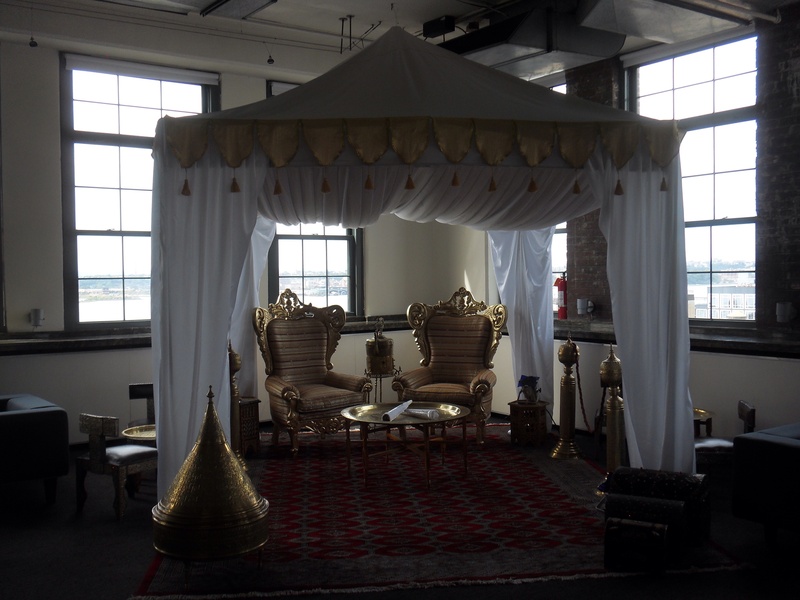 Our Moroccan Caidale Tents can be custom made in many different sizes and styles. Our goal is to provide our customers with excellent handmade products, which help support and encourage extraordinary craftsmanship. Call us today at (917) 434-3889, email us or take a moment to fill out the contact form and someone will contact you immediately to answer any questions. 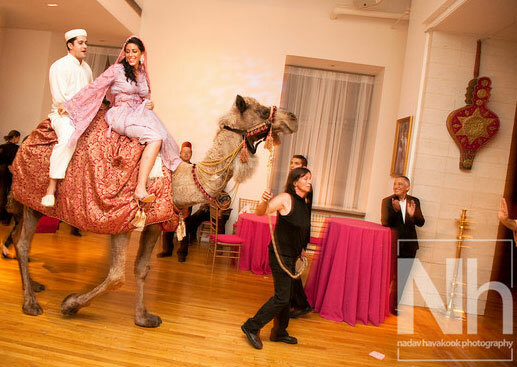 Our staff will begin right away on fulfilling your Moroccan tent rental needs. Please allow 16 to 18 weeks for delivery of custom orders.